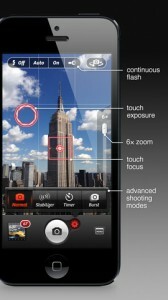 “Camera +” improves your iPhone photos, by correcting exposure and focus. It’s a 99 cent app not to be confused with the free “Camera Plus,” which doesn’t do much of anything. With Camera+. we got big improvements in our pictures. Tapping “portrait” improved a face. Tapping “scenery” heightened our scene.